On my right sidebar you'll notice our newest family photo (which I am in LOVE with!!!) My husband's sister Jenn, is one of the most talented photographers that I know... and I'm absolutely NOT biased! She's incredible at capturing 'stolen moments in time!' And in case you hadn't realized it by reading my family blog, stolen moments are my FAVORITE memories! Without further adieu, here is the talented Jenn Anibal, whom I proudly call my sister! 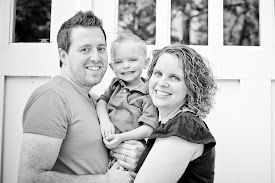 OK, so the above link it solely to my sweet little family session, check out the rest of her photo art HERE! she does beautiful work! great new family picture! the pictures and your family are beautiful.. I love the shot of the three of you walking a way. Laura, they are wonderful! You look absolutely radiant too. I agree that she did an excellent job. Beautiful photos! Your sister does capture those little moments & expressions well. Your son is so cute - love the matching hairdos with your hubby. I especially like the photo of your son hugging you and his eyes are tightly shut. Very sweet. Thanks for sharing. Nice photos! Thanks for sharing your family with us. Thank you for all of the sweet comments! I couldn't resist sharing the pictures!!! Wow all of the photos are GREAT!!! I also looked at his first haircut ones..very adorable!! I wish I lived closer..I would love to have her as a photographer!